Happy 10th Anniversary to MLT! Wishing MLT a wonderful 10th anniversary celebration this week! Members of our team had a terrific time at the MLT gala last night. Pictured left to right: Yordanos Eyoel (Manager, New Profit), Nithyaa Venkataramani (Talent Fellow, New Profit), Jeff Berndt (New Profit alumni, now of Roundtable Investment Partners), John Rice (MLT Founder & CEO), Liz Riker (Senior Partner, New Profit), Kelly Cutler (Associate Partner, New Profit), Jennifer Anderson (Chief Talent Officer, New Profit). Management Leadership for Tomorrow (MLT) is the premier career development institution that equips high potential African Americans, Hispanics and Native Americans with the key ingredients—skills, coaching and door-opening relationships—that unlock their potential. By cracking the code on career potential, MLT is developing the next generation of minority leaders, for the corporate, non-profit and entrepreneurial sectors, who will in turn have transformational impact on our communities. MLT delivers programming that puts minorities on the fast-track to success at every stage of their careers: from College through MBA and the Executive levels. 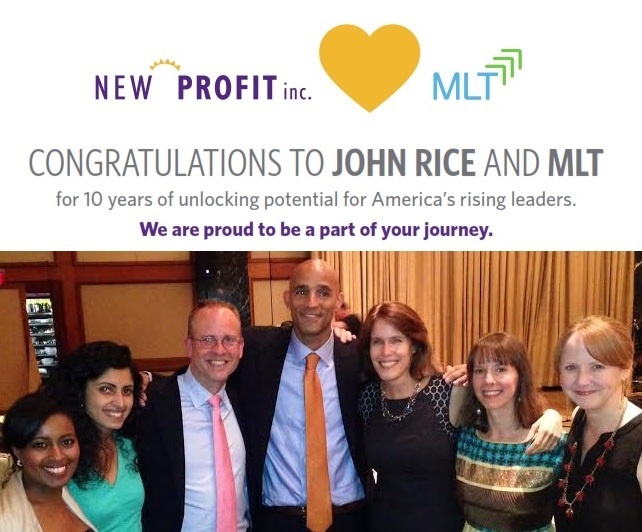 New Profit is a proud funder of MLT.